Today I wanted to share a quick and easy meal because I know what a challenge getting dinner on the table can be after having a baby. Especially when you’ve got two other little kids running around. But everyone’s got to eat, right? So I like to stick to super simple meals that require just a few ingredients. And if there’s any way to make them a little healthier, I do that too. 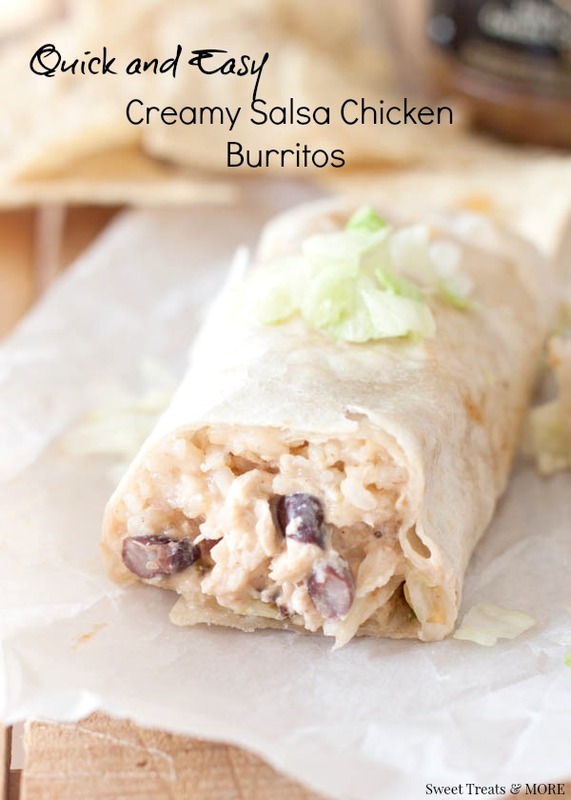 These Creamy Salsa Chicken Burritos only take 10-15 minutes to throw together! Shredded rotisserie chicken, Greek yogurt, salsa (your choice), and black beans, make a super creamy, flavorful chicken filling to stuff inside a warm tortilla. 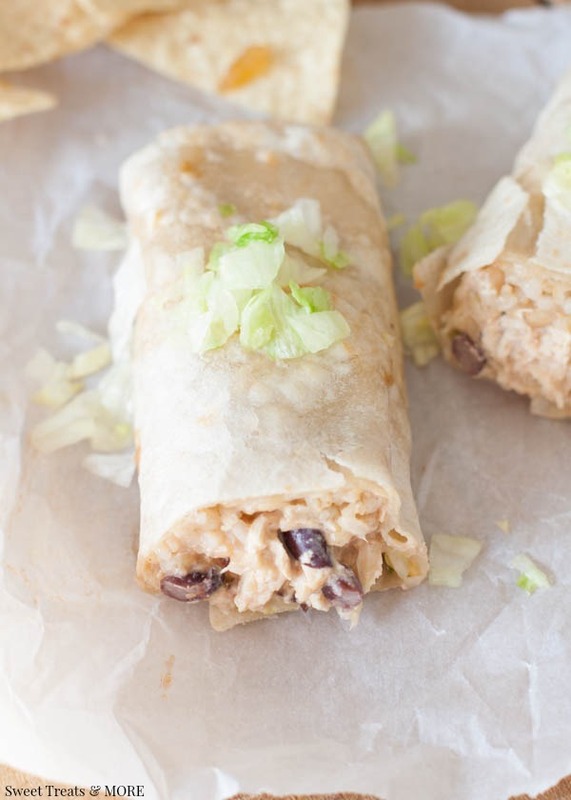 Roll them up with a little brown rice, lettuce, and cheese and you’ve got a great tasting burrito! The Greek yogurt makes the filling especially creamy, and I promise, no one will know you used Greek yogurt! Make these as mild or as spicy as you’d like with the type of salsa you use! In a saucepan, whisk Greek yogurt, salsa, cumin, garlic, and salt and pepper together over medium heat. Stir in shredded chicken, black beans, and ½ cup of shredded cheese. Cook over medium heat until cheese is melted and mixture is hot. Thanks so much Kristy for being here today! Quick and easy is always good here and I love how these are flavored! These look delicious! Do you think they would freeze ok? Yum! These look delicious! I'm adding this to my menu after baby comes! I'm a little nervous with a husband and a hungry boy already! What will we eat!! How many calories are each burrito? These taste exactly as their name. Creamy. Salsa. Chicken. Which turns out, tastes pretty stinkin' awesome. I used Fage Greek Yogurt (0 fat) which tasted very similar to sour cream to me, but without all the bad stuff that you get with sour cream! Pair it with brown rice and whole wheat tortillas and you've got yourself an awesome dinner. My whole family loved them.